It's officially Christmas break at our house, so let the holiday baking begin!!!! 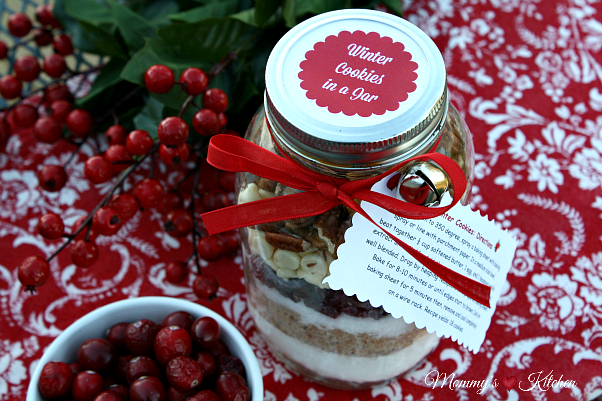 Do you love homemade cookie mixes in a jar? Mixes in a jar are one of my favorite gifts to give. 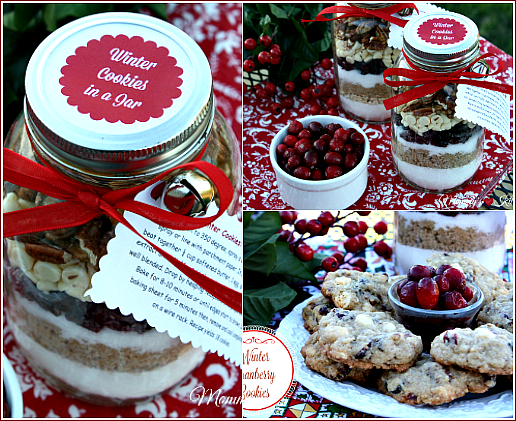 I love the idea of giving cookie gift mixes to friends, family, neighbors or co-workers, because it gives them the opportunity to bake the cookies at their own convenience. These cookies are one of my favorite holiday cookies. There's just something about the combination of cranberries, white chocolate and toasted pecans. These buttery cookies are thick and chewy with oatmeal, white chocolate chips, sweet dried cranberries and pecans. 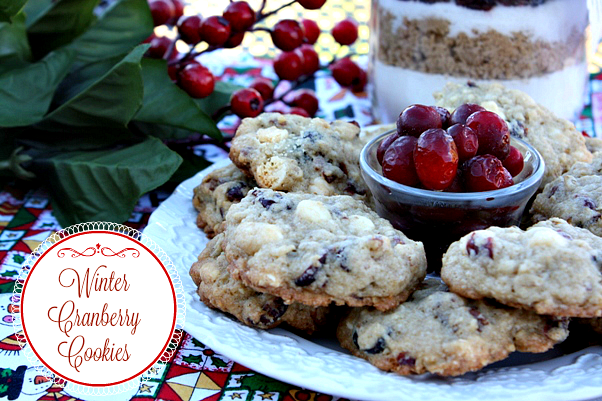 These festive cookies would make a wonderful addition to your holiday cookie tray. Now let's get started on this easy recipe. 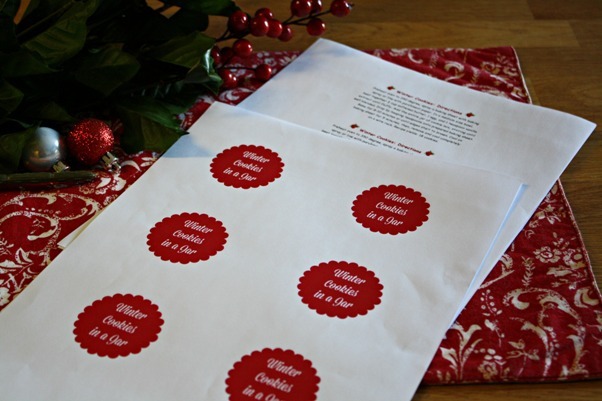 Along with this cookie recipe I've included a link for a printable cranberry cookie jar labels and the intructions tag. Click on the links and then select the printer icon at the top of the page to print the tags. I have made the link public to the web, so everyone can have access. In a medium size bowl combine the the flour, baking soda and salt. In a 1 - quart mason jar, add the flour mixture. Evenly layer the additional ingredients in the following order. 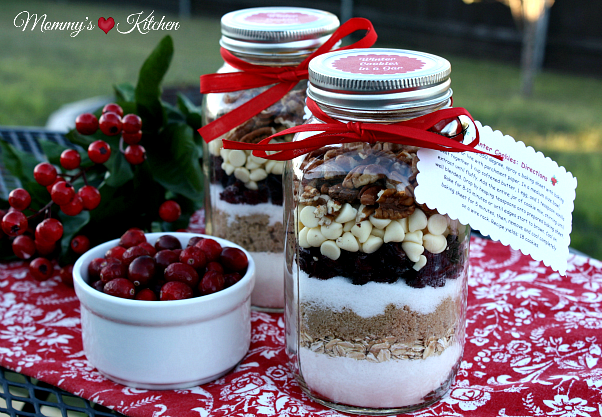 Oatmeal, brown sugar, granulated sugar, dried cranberries, white chocolate chips and pecan pieces. Add the lid and close the jar. Place a recipe label on the top of the lid and add the directions tag. Punch a whole in the directions tag with a hole puncher and run a ribbon through and attach to the jar by tying into a bow. I added a jingle bell through the ribbon for a festive touch. Preheat oven to 350 degree, spray a baking sheet with baking spray or line with parchment paper. In a medium size bowl, beat together ½ cup softened butter, 1 egg, and 1 teaspoon vanilla extract until fluffy. Add the entire jar of cookie mix, stirring until well blended. Drop by heaping teaspoons onto prepared baking sheet. Bake for 8-10 minutes or until edges start to brown. Cool on baking sheet for 5 minutes, then, remove and cool completely on a wire rack. My cookies didn’t spread. They tasted great but were little balls. Any guesses as to why that may have happened?